As I have said before, I am a huge fan of ramen. Not the instant stuff (although in a pinch, that stuff’s not half bad), but the fresh kind with real toppings. I fell in love with it in Japan, and I get out to Ginza Ramen whenever I can. But ever since my husband’s birthday dinner, now that I’ve learned how to make the good stuff at home, I probably eat it way more than I should. Not that my family minds, they’re just as big into it as I am. I started off by using up the Shoyu base (page 8 of Simply Ramen by Amy Kimoto-Kahn (2016)). The recipe is also available for free on the author’s website at easypeasyjapanesey.com. I have since made a couple of batches of this broth and I still love how easy it is to make and how packed with flavour the broth turns out. If you’re like me and you like making things that you can just throw in the slow cooker for eleven hours, then you’ll love this recipe. I also like that this recipe makes up enough broth for eight or so servings, so I can freeze the excess for an easy meal later on. As with many of my noodle soups, the toppings were less a pre-planned dish and more whatever we had in the fridge/freezer at the time. 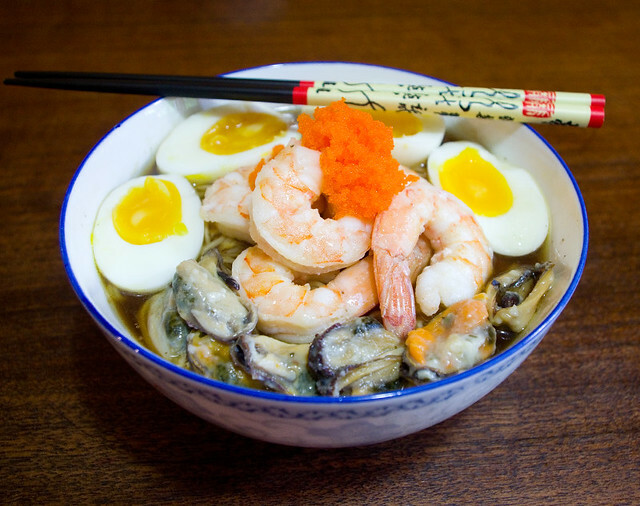 I included soft-boiled eggs, garlic shrimp, masago (capelin roe), and mussels cooked in white wine and garlic butter. The mussels were the kind that come in a vacuum-pack with the sauce and are meant to be cooked in the microwave or by dumping the whole pack in a pot of boiling water. I’m fully aware that this isn’t terribly classy, but it was delicious. 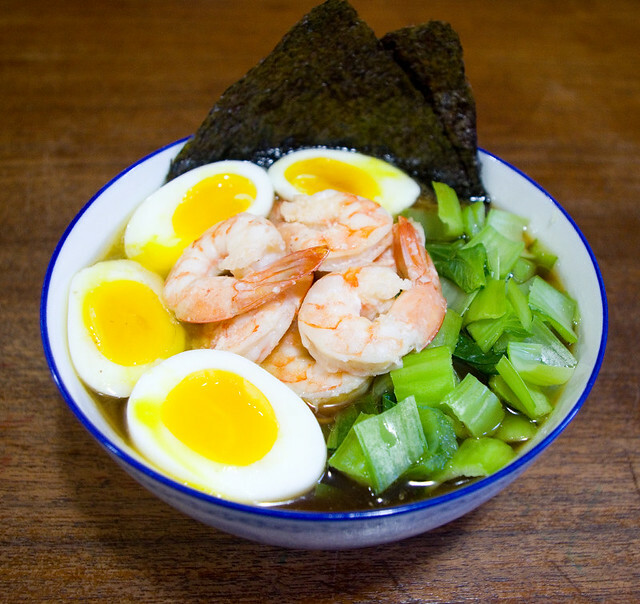 My second shoyu ramen was topped with soft-boiled eggs and garlic shrimp; these two ingredients are pretty common in the food I prepare because there are almost always eggs in the fridge and shrimp in the freezer. This time I also included baby bok choy and squares of nori (dried seaweed sheets). 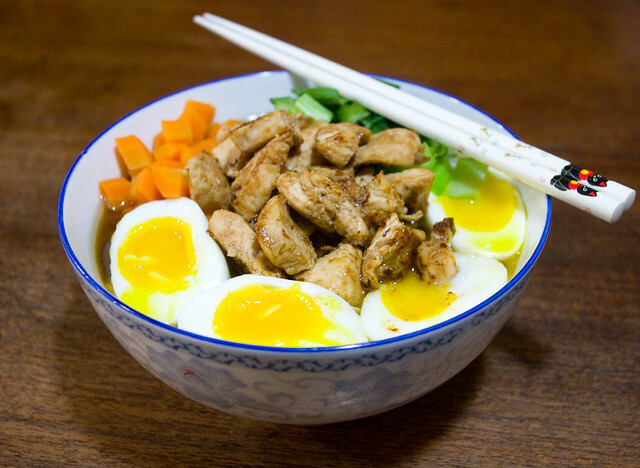 I topped my third ramen with soft-boiled eggs, carrots, bok choy, and teriyaki chicken breast. I had never thought to combine teriyaki and ramen until I went to Umi Sushi Express in the food court of Rideau Center a while back, and I was pleasantly surprised when I ordered this dish. I mean, Umi Sushi is still fast food, and it’s nothing compared to the fantastic variety of ramen available in Japan, but it’s probably the best thing in the food court. Now if I can only find out what kind of hot sauce they used. Posted on September 7, 2017 September 18, 2017 by owntwohandsblogPosted in CookingTagged broth, dinner, food, homemade, japan, japanese, noodles, ramen, shoyu, soup, supper.